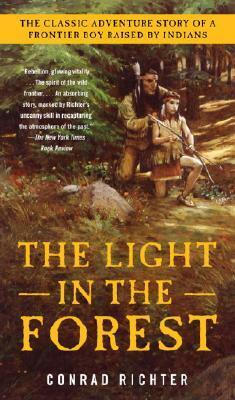 The Light in the Forest is a novel which was assigned to me as a seventh grader in the mid-1990s, and which I always remembered fondly as being one of the books I was forced to read in school that I actually enjoyed. When John Butler was four years old, he was kidnapped from his white family and adopted into the Lenni Lenape tribe, where he was given the name True Son. At age fifteen in 1764, he is now being forced to return to his birth parents' home, where he is expected to immediately adopt the white lifestyle. This is a struggle for True Son, who wants nothing more than to return to his Indian parents and the freedom he associates with tribal life. I have to confess that I can't figure out why I liked this book so much as a twelve-year-old. Though the premise of the story is intriguing from a psychological perspective, the writing seems much more dry to me than I remember. I can see why the themes in the story - alienation, isolation, identity, and finding one's place - would be appealing to a middle school audience, and I'm sure this is why the book was assigned to begin with, but I don't see what would have made it stand out as such an interesting book to me personally. As an adult, I didn't really connect with the characters at all, and I found it a struggle to finish to the end. From an educational perspective, this book does provide important details about the differences between the Indian way of life and the white way of life, and about the impact each culture had on the other during the early days of the United States. It is a logical choice to include in American History lessons for middle schoolers, as it provides an emotional way to connect with the subject matter. I think I like Elisa Carbone's Blood on the River slightly better, especially because its characters are based on real people, and the story provides a broader view of the time period, but this is a matter of personal preference more than a statement about the quality of either book. This one hasn't circulated much in my library: I should give it a good smell and see if that's why! You might have liked this because you were studying the subject, had an interest, and this brought it more to life. I have students who study Ancient Rome and suddenly want to read everything they can find set during that time.